One very simple but still useful representation of any automatic translation process is the following triangle which was introduced by French Researcher B. Vauquois in 1968. The triangle represents the process of transforming the source sentence into the target sentence in 3 different steps. The left side of the triangle characterizes the source language; the right side the target language. 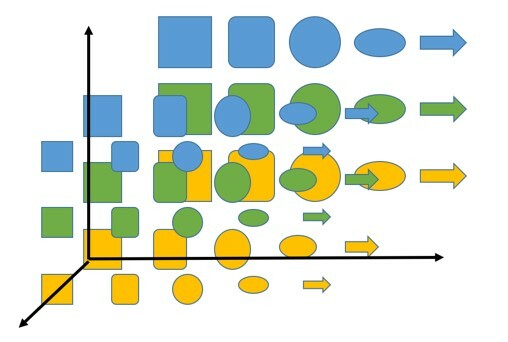 The different levels inside the triangle represent the depth of the analysis of the source sentence, for instance the syntactic or semantic analysis. We now know that we cannot separate the syntactic and semantic analysis of a given sentence, but still the theory is that you can dig deeper and deeper into the analysis of a given sentence. The first red arrow represents the analysis of the sentence in the source language. From the actual sentence, which is just a sequence of words, we can build an internal representation corresponding to how deep we can analyze the sentence. For instance, on one level we can determine the parts of speech of each word (noun, verb, etc. 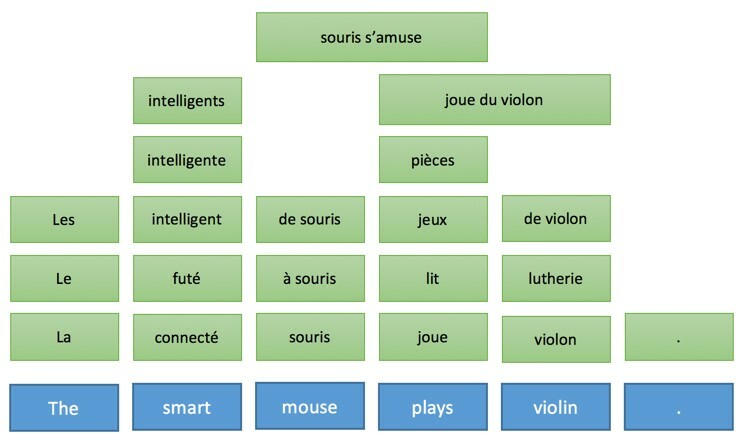 ), and on another we can connect words: for instance, which noun phrase is the subject of which verb. 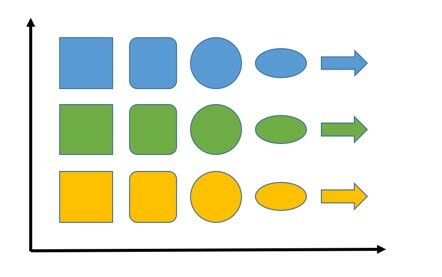 When the analysis is finished, the sentence is “transferred” by a second process into a representation of equal or slightly less depth in the target language. Then, a third process called “generation” generates the actual target sentence from this internal representation, i.e. a meaningful sequence of words in the target language. The idea of using a triangle is that the higher/deeper you analyze the source language, the smaller/simpler the transfer phase. Ultimately, if we could convert a source language into a universal “interlingua” representation during this analysis, then we would not need to perform any transfer at all – and we would only need an analyzer and generator for each language to translate from any language to any language. These rules and lexical items are « readable » and can be modified by linguist/lexicographer. 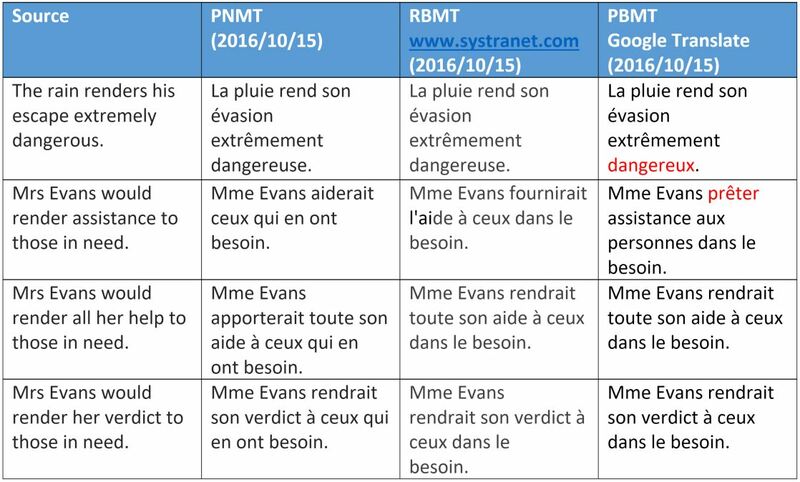 Phrase-Based Machine Translation is the simplest and most popular version of statistical machine translation. As of today, it is still the main paradigm used behind major online translation services. Technically-speaking, phrase-based machine translation does not follow the process defined by Vauquois. Not only is there no analysis or generation, but more importantly the transfer part is not deterministic. This is to say that the engine can generate multiple translations for one source sentence, and the strength of the approach resides in its ability to select the best one. However, thanks to smart probability calculations and smarter search algorithms, only the most likely translation will be explored and the best one kept. Intuitively, search algorithms prefer to use sequences of words that are probable translations of the source words, with a probable reordering scheme, and generate sequences of words in the target language with a high probability. In this approach, there is no implicit or explicit linguistic or semantic knowledge. Many variants have been proposed and some show improvements, but to our knowledge and from what we can observe, the main online translation engines use the base mechanism. The “transfer” is called decoding and directly generates the target form without any generation phase. This is not a strict constraint, and could possibly be evolving, but it is how the baseline technology works. The sequence of source contexts (ContextS 1, … ContextS 5) is the internal representation of the source sentence on the Vauquois triangle and as mentioned above it is a sequence of float numbers (typically 1000 float numbers associated to each source word). For now, we won’t discuss how this transformation is performed and how the encoder works, but we would like to point out that what is particularly interesting is the initial transformation of words in the vector of floats. This is actually a building block of the technology, and as is the case in a rule-based system where each word is first looked up in a monolingual dictionary, the first step of the encoder is to look up each source word in a word embedding table. Part of how meanings are represented in neural machine translation are in the word embedding. If we add more color or shapes, we might also add more dimensions so that any given point can represent different objects and distances between two objects that reflect their similarity. The underlying idea is the same with word embedding. Instead of objects there are words, the space is far bigger– for instance, we use 800 dimensions– but the idea is that words can be represented in such a space with the same properties. Hence, words with some common property will be near on one dimension of this space. For instance, we can imagine that the part of speech of words are one dimension, their gender if any, another, the fact that they are negative or positive words another, and so on. We don’t exactly know how word embedding are constituted. Another article will dissect word embeddings in more detail, but the idea is as simple as organizing objects in space. The previously translated word using a word embedding to convert the actual word into a vector that the decoder can actually handle. The translation will end when the decoder “decides” to generate an end-of-sentence special word. The complete process is undeniably mysterious, and we will need several articles to dig into the different components. 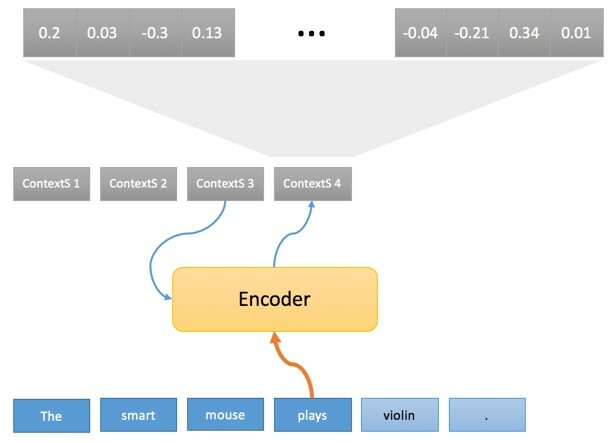 The key point to remember is that the translation process of a Neural Machine Translation engine follows the same sequence of operations as a rule-based engine, however, the nature of the operations and the objects manipulated are completely different – and the starting point of the conversion of words into vectors is the word embedding – and this is good enough to get an idea of how the following examples work. Let us look at some translation examples and discuss what we have highlighted today on why/how some examples don’t work for the different technologies. We have selected several polysemic verbs in English and are looking at English-French translations. What we can see is PBMT mainly interprets “render” as a meaning – except for the very idiomatic “render assistance”. This can be easily explained – the selection of the meaning depends either on a long distance check on the sentence structure, or on the semantic category of the object. For NMT, the fact that it correctly processes “help” and “assistance” in a similar way shows some benefit of word embedding, plus the apparent ability to get some long distance syntactic information that we will cover in another article. Here again, the fact that the NMT engine distinguishes semantically between the two types of objects (basically human or not) seems to be a direct benefit of the word embedding. However, let us note that it does not correctly translate “rounds,” which in this example means “bullet.” We will explain this type of interpretation in another article on how trainings teach the neural network a specific meaning for each word. As for the rule-based engine, only the 3rd meaning of the verb is recognized, which is more appropriate for a rocket than for a bullet. Above is another interesting example in which the difference of meaning of the verb stems from the object (crime or destination) which is again one direct knowledge from the word embedding. The other engines are not wrong, as they use the same verb, which is acceptable in both contexts. 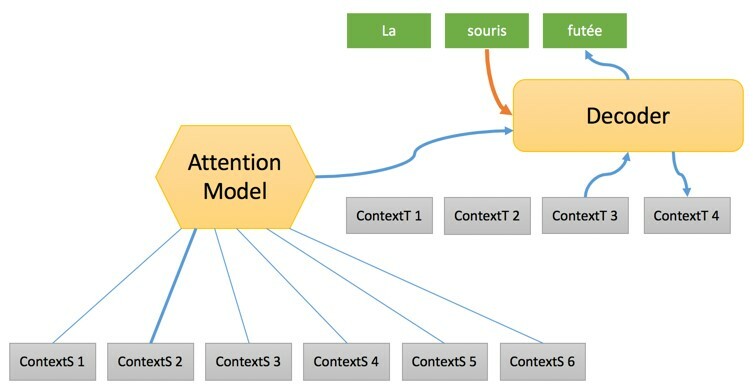 This entry was posted in Insight articles and tagged neural machine translation, Neural Machine translation Insight, NMT, PNMT, RBMT, SMT by Gaelle Bou. Bookmark the permalink.